ECig is registered trade name of Superdragon Group. ECig is modern Electronic cigarette, patent holder is Superdragon Group. UK Patent No. 2 466 758. Our ECig are Gold medal winner in recognition of innovative excellence in the category of health and fitness, INPEX, Pittsburgh USA 2011, and Gold medal winner of 39th International exhibition of invention of Geneva, Double Gold awards in British International Invention & Design of the year 2011 London and Gold medal in International Trade Fair of Ideas-Invention-New products Nuremberg Germany 2011. Ecig is a unique, better-designed electronic cigarette with separate cartridge and separate atomizer for safer, more hygienic, more effective filtration. Incorporates a separate 100% sealed cartridge and a separate atomizer, unlike current single-unit electronic cigarettes with cartomizers that have heavy metal elements mixing with the e-liquid. 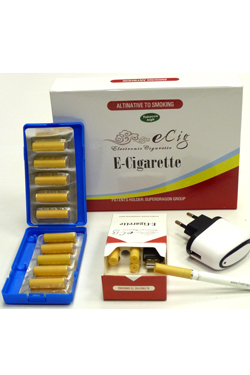 Ecig pack contains: one battery, one atomizer; one USB charger, one EU wall USB adaptor; 13 cartridges (10 in one child-proof box; 3 in E-cigarette pack); All are in one gift box.